Sukhumvit Soi 16 is this stubby little street near the intersection of Sukhumvit and Asoke Ratchadapisek Roads. It branches off Asoke about 100 meters down from the main intersection and then forms the back exit for all of the office buildings and condominiums that line Asoke Ratchadapisek Road, overlooking the beautiful Benjakiti Park next to the Queen Sirikit Convention Center. 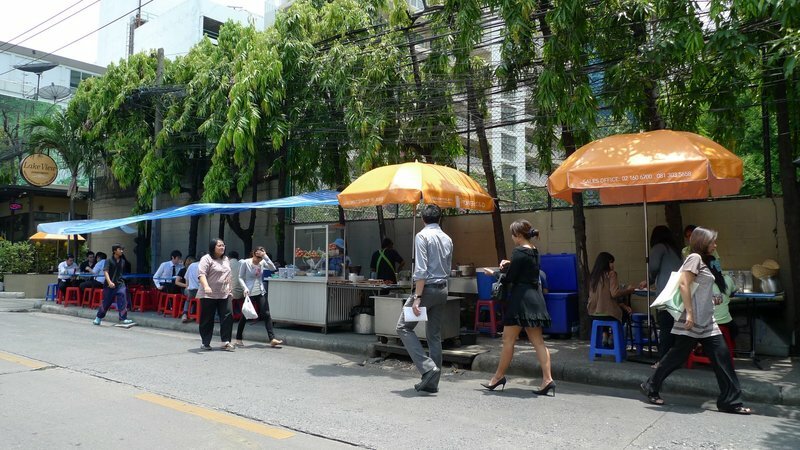 Lining both sides of the soi at regular intervals are these street vendor stalls, the classic types of Thai street food that hug the street and, where one exists, generally push pedestrians off the footpaths. Across from the street vendor pictured above, on an unpaved shoulder lined with a masonry wall, we found our beef noodles. The tables were overflowing and since we had arrived about 1:00, the tail end of the lunch rush, the wizened old uncle who runs the stall told us that he was out of everything but the thin rice noodles and the stewed brisket and beef balls. We ordered one bowl apiece and one of the other people working there – a relative, no doubt – found us a spot as a table of office workers finished up the last drops of broth in their bowls. A few minutes later our order arrived: a simple bowl of thin rice noodles swimming in deliciously rich cardamom-flavored broth, with slices of brisket, beef balls, green onions, and bean sprouts. As we were eating, the uncle came over and apologized that the brisket wasn’t as tender as normal – the meat vendor had arrived late this morning so it hadn’t stewed as long as he would have liked. We assured him it was not a problem – and it wasn’t – especially as we enjoyed the wonderful broth. After finishing our noodles and paying – including weak tea we paid something like 28 baht (US$ 1) each. Chatting with the uncle after the lunchtime rush, he explained that he’s been in business at that location for 40 years, gaining his reputation during the Vietnam War with American servicemen who were stationed nearby. He explained how one building just down the soi, which is now the home of a nice brunch restaurant called Kuppa, was the headquarters for the American FBI. They found this out when one day a stray soi dog was clipped by a vehicle and was lying in the street, howling in pain. After a while, an American came out of that building, pulled out a gun, and put the dog out of its misery. And that, uncle explained, is how they found out the FBI worked there. Never mind that the FBI was a domestic agency and probably wasn’t here in Thailand during the Vietnam War, it was an interesting story that provided a spicy not to the end of our lunchtime adventure. This entry was posted in Uncategorized and tagged Bangkok, Beef, Chow, food, Krungthep, noodles, Stall, street, Thailand, vendor by christao408. Bookmark the permalink. The story is part of the atmosphere of the place. The food looks good. Looks yummy. Perhaps he got the FBI and CIA confused? Looks good… Maybe you should try to get a Thai food show on the Food Network or something, Chris… I always love what you present! Interesting location, Chris. And this is near the Emporium too. The noodle looks quite delicious. Would like to give it a try! They’re literally on the sidewalks! 😀 So like Manila but sidewalk vendors are illegal here and nothing like a whole food stall like that. @oxyGENE_08 – Oh, I only wish it was illegal for the vendors to block the sidewalks. It is a major bother. @Passionflwr86 – Nah, Anthony Bourdain has already tread that path! =D@npr32486 – That’s what I was thinking, too. @CurryPuffy – Not too far away from Emporium. @Fatcat723 – The story gives a whole different flavor to the place, no pun intended. @christao408 – But EVERYONE is ABOVE the law here! hehe…you’ll see them everywhere. They’ll just run when they see an officer coming their way. oh…. really wish i can go to bkk end of this year… haha if yes, will let you know!! @yang1815 – That was my thought, too. @oxyGENE_08 – I don’t think these guys could fold up their operations quickly enough to run away. Plus, they pay the cops “rent” money. @lcfu – Oh, do let me know if you can make it. I’m guessing they don’t need permits? How do they wash dishes etc and get power? That bluish green tarp made the soup look kinda strange. Didn’t you bring your studio lights? 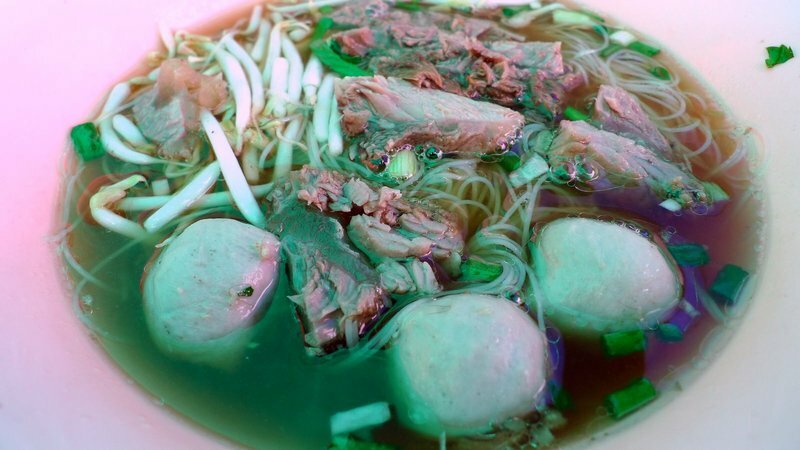 At first I thought the broth was green – then realized it was the reflection from the umbrella over head. Looks yummy! @murisopsis – Yeah, it was a blue umbrella and I did the best I could to color-correct. Still has a greenish cast, but the real broth was very rich brown in color. @ElusiveWords – Not sure they need power as the cooking is done by gas. There are some large tubs of water and they fill large bottles at some local tap for more water for washing dishes. Probably not the most hygienic situation, but generally speaking street food in Thailand is pretty clean. As for permits, they pay a fee to the local police station. @christao408 – IKR! But the “pay the cops” thing happens here too. I just love how corruption is everywhere.